Call-To-Action – Englewood Quality of Life Summit! | R.A.G.E. 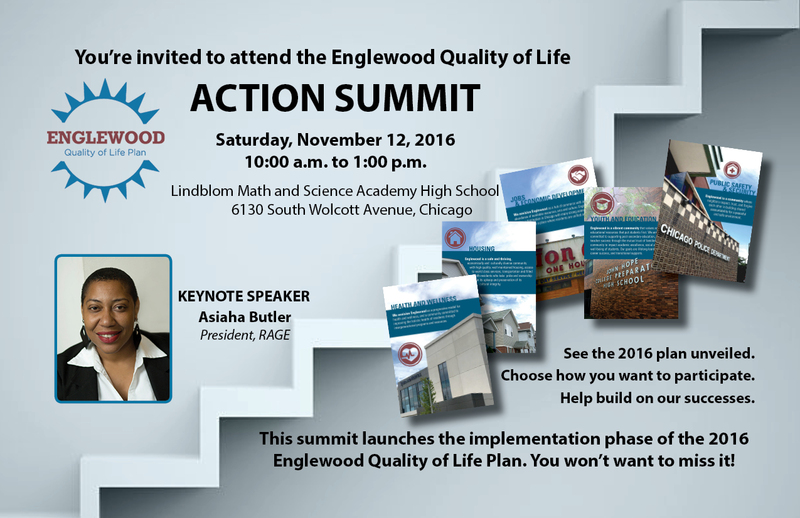 Call-To-Action – Englewood Quality of Life Summit! Please plan to attend the Englewood Quality of Life Plan “Call-to-Action” Summit on Saturday, November 12th at 10am-1pm at Lindblom Math and Science Academy located at 6130 S. Wolcott Ave, where our President, Asiaha Butler, will serve as the keynote speaker. After accomplishing goals many thought impossible, Englewood community leaders, clergy, aldermen and residents will outline their next steps in the ongoing effort to make the neighborhood a safer, more desirable place to live, work and conduct business. The second phase of Englewood’s Quality of Life Plan—developed and executed by the community with the support of the City of Chicago and theLISC/Chicago’s New Communities Program—will be unveiled Saturday, November 12 at Lindblom Math and Science Academy. This Call-to-Action Summit begins at 10am. Englewood Village Meeting – Nov. 15th!